The cayenne pepper and cumin seeds give it a warming affect, the black beans and potato satisfy insatiable appetites and the festive pumpkin makes it an ideal option for pre or post Halloween celebrations. Jacket potatoes should be baked in the oven to achieve the tastiest flavour and the crunchiest skins. The perfect Autumnal chilli to warm you up from the inside out. All recipes on The Natural Essex Girl are vegan. First things first, get your jacket potatoes in the oven, piercing the skins to avoid them exploding, and bake for at least one hour on around 180 degrees. Whilst the jackets are cooking, throw diced onion, cumin seeds, diced garlic, chilli, cayenne pepper, oregano and black pepper in a pan with olive oil or a little water. When the jackets have been in for about 30-40 minutes, fry off these pan ingredients on a low heat, adding in tomato paste after a couple of minutes and stirring this into your other seasonings. Then, add chopped tomatoes, pumpkin and any other vegetables you desire along with drained black beans. Leave the pan on a low to mid heat until your jacket potatoes are ready. 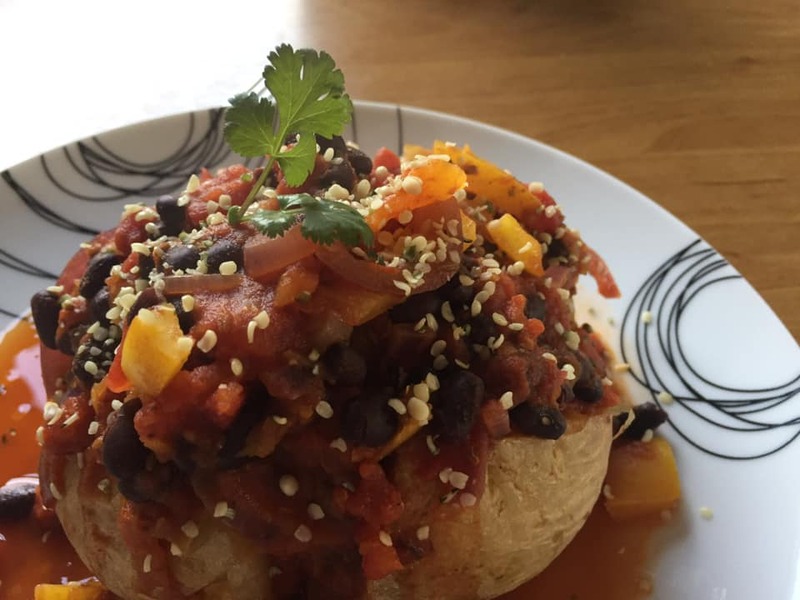 Pour your delicious Black Bean and Pumpkin Chilli over your jacket potato and serve. Consider adding coriander, homemade guacamole, hemp seeds and/or coconut yoghurt to serve.